Routinely labelled one of the creepiest places in the world, The Island of the Dolls looks and sounds like something straight out of a Steven King novel. Located on an ancient Mexican canal network, it's the kind of place where the Chapman Brothers would feel right at home, such is the quantity of ill-formed humanoid plastic on display. In 2011, Debrah Eastwood visited the island with camera in hand. Thankfully, she survived to tell Jordan Ogg all about her trip. These dolls are creepy as hell. What's the story behind them? Yeah they are! The story goes that a resident named Don Julian witnessed an accident in which a tourist girl fell into the canal and drowned. From that day on, Julian would see her ghost, and in order to appease or scare off the spirit he began collecting old dolls from the canals, from dumpsters, markets, etc., and hung them all over the island like Christmas tree decorations. Apparently this stopped her apparitions, but he continued hanging the dolls for another 25 years until he died a few years ago. 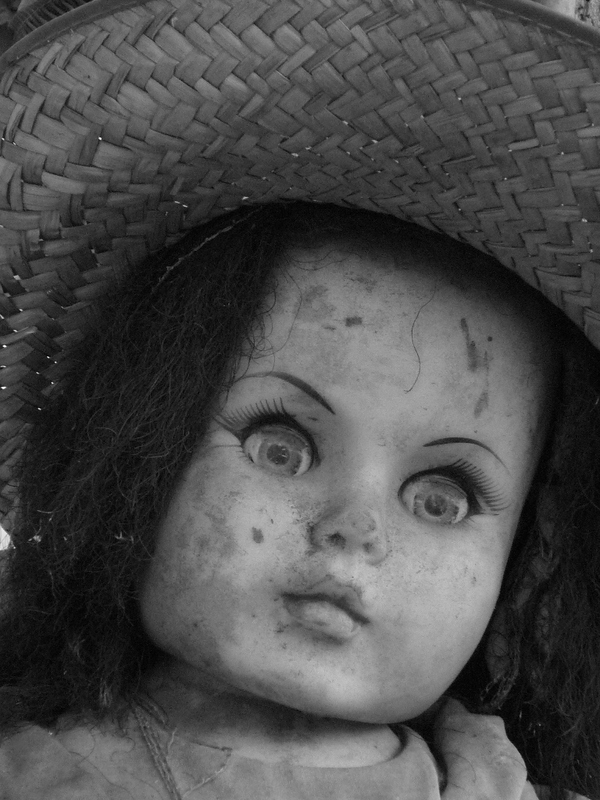 Since his death, visitors to the island have continued to bring dolls there. How did you get to the island? I was in Mexico City in 2011 on a trip around Central and South America. 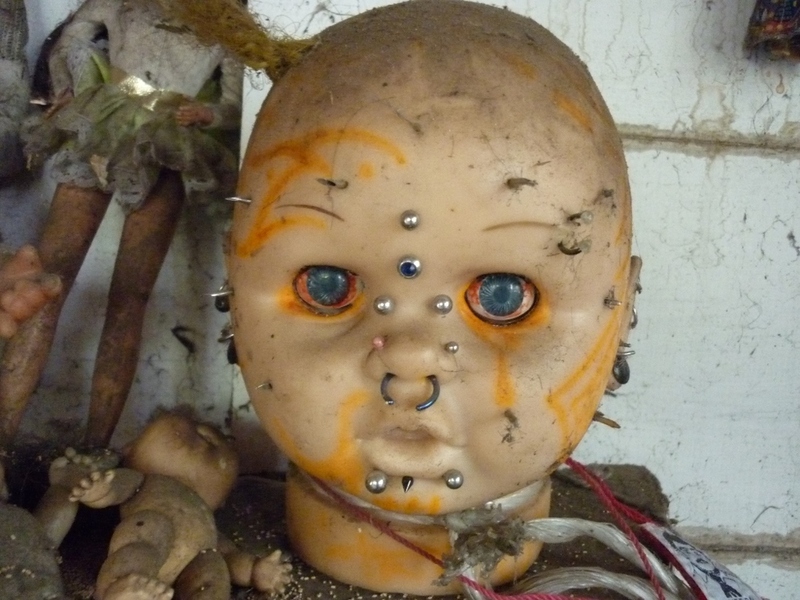 I am really interested in Mexican culture and folklore, and while in a hostel I came across a travel guide that had one line about a place called the Island of the Dolls on the outskirts of the city. I was intrigued and asked a few local friends and strangers about it. They all told me they had never been and were too scared to go. Unperturbed, I travelled alone on a couple of trains to a place called Xochimilco, where the Aztecs built canals that housed several little garden islands. I managed to convince Carlos, a young barco (barge) punter that I needed to visit the island, even though he was incredulous and told me I was crazy. After a pleasant two hour barco journey through the canals, the first thing I saw when we hit land was a doll's head on a stake. It was frightening and very surreal. I let my curiosity overrule my fear because I just couldn't believe such a place existed. There were so many mangled dolls in every tree and crevice, like a wonderland for dirty and scary doll enthusiasts. I really wanted to capture the feeling, so I went around quickly and took as many photos as I could. 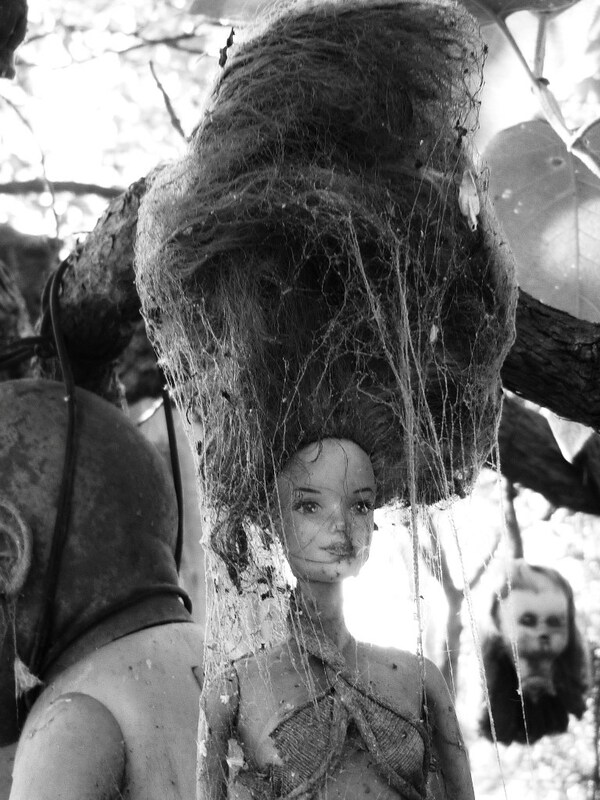 The island caretaker, a relative of the late Don Julian, invited me to a shack in the middle of the island which was covered with absolutely filthy dolls and cobwebs to hear a brief talk about the history of the place. The shack had a particular sickening musty smell of rotting wood. In the middle was a shrine for a spectacled doll named Antonina. She was surrounded by keepsakes, bracelets and other religious items, and behind her smiled the framed face of Don Julian. The guide said Antonina was Julian's favourite and people would visit and leave keepsakes to her and ask for miracles, which were often granted. He ended by saying that almost all the visitors reported how the dolls' eyes followed them, and some even moved their limbs. At that point I was more than ready to leave. I won't lie, I was scared. I was on my own, pretty deep in the maze of canals, with a caretaker who lived his life surrounded by the horrific "living" dolls. I was conscious that Carlos was waiting in the barco, which was comforting, but there was an eerie feeling all over; too many pairs of sunken eye sockets and sunburned plastic doll parts around. What's it like when you see these images now? I don't look at the images too often, but when I do, it still brings back goosebumps and the sick feeling I had in my gut. It is one of the most unusual places I have ever visited, and for that alone I am glad; but if I ever go back, I will make sure to bring a friend and freak them out too. Click on any thumbnail to view the gallery full size. Debrah Eastwood is of Filipino and English heritage, was born in Italy, and grew up in Turin, Rome, Los Angeles, Oxford, Wales, and Manila. She graduated from Liverpool University and worked in London as a water engineer before quitting and travelling. She now lives on a small island in the Philippines working for her family and making music as Skint Eastwood.